One day a month or so ago, I just decided that I couldn't hold on to these fabrics forever (my favorite Heather Ross prints), so I just started cutting and cutting, and eventually had this HUGE (for me) quilt that now lives on my daughters twin bed. I don't know if she loves it. She would probably pick princesses or something like that, but I love it and love that I used up so many favorite fabrics! I used a fons and porter triangle ruler and cutting out the triangles went really fast. Actually sewing them together went great too. I quilted it a quarter inch from each seam. I love the look of this type of quilting. If I'm going to quilt a bed size quilt, it has to be fairly easy, and this was! Just takes time. I pieced the back with prints from the front, and then bound it in a pink and white stripe. I still love those stripes! 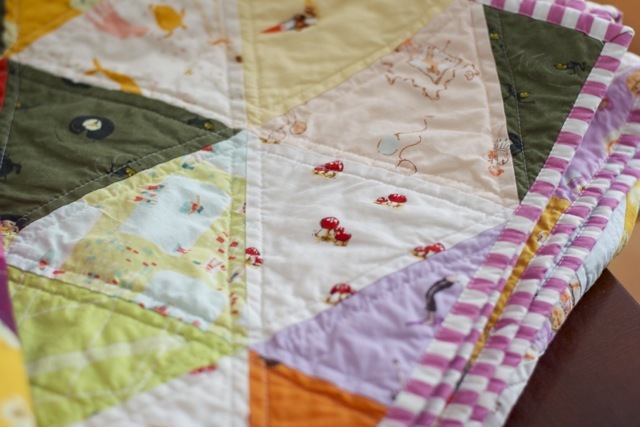 Every piece of fabric from this quilt came from my stash! YaY! I have been trying to use what I have, and I can actually see my stash shrinking a little. It feels good. ps: I am destashing some fabric in my etsy shop. I'm listing it as fast as I can...but really, that's pretty slow. LOVE! Especially with it all stash! It looks so soft and snuggle-ready, I love it! That's so dreamy! Good for you, taking the plunge and using your HR stash--I'm still hoarding mine, I can't help it! Ooooh, I love it! I love triangle quilts. What a bonus that it's all stash fabric, and your favorites too. I love it! 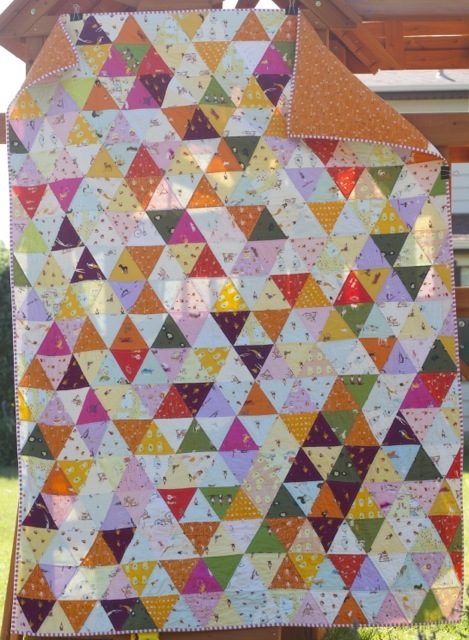 The colors scream summer to me and I really like all the triangles! oh, so adorable and snuggly looking! So so so pretty! I'm loving triangles, I need one of these rulers, I think. Yay for stash busting! What a fun quilt! Good for you! Beautiful! A great way to show off the prints too! it's so beautiful! good for you for you for using up your stash. I think I always have to make a conscience effort to do that, otherwise I just go fabric shopping wild (there's always something I need, haha). how fabulous!!! you will love that thing forever! Ta da! You should be saying "ta da". It's definitely ta da worthy. Love it! The colors and the triangles and especially the pink striped binding. It's gorgeous! And so cheery. Every time you make a quilt, I want to make one just like it. What a stunner! Love this quilt!! It's awesome! It looks so modern! I love the striped binding, too! Very pretty. I love scrappy stuff, the scrappier the better, and the fact that it all came from your stash is an added plus. Thank you for sharing. How lovely!! The scrappy colors are fab! It must have been hard to make the first cut but I think it was worth it. Don't know how you got to make the triangles meet up so neatly. Maybe I need to get one of those rulers. Gorgeous! 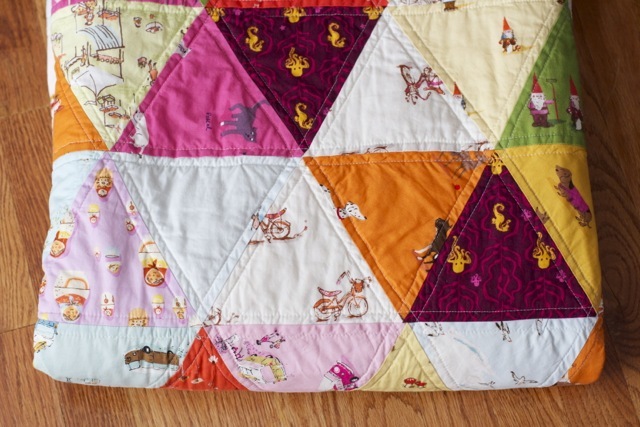 That is the perfect Heather Ross quilt. I am still hoarding my stash, deciding what to do with it all. tis beautiful! love it all and the binding! that's great that you made a quilt with your treasured favorites. and all from stash! it's a beauty! I absolutely love this quilt!! Wish I had gotten into quilting earlier so I could have snagged some of those awesome fabrics ;), but knowing me I would be too scared to ever cut into them. I'm dying to make a triangle quilt, any tips you can pass along (other than the ruler, I need to get one of those!)? Just cut up my Mendocino for the same after making another triangle quilt. I'm loving triangles right now and yours is so cute! Well, I don't know if your daughter loves it, but I sure do! This is a wonderful example of using a simple pattern, great fabrics and simple quilting to make a beautiful quilt. 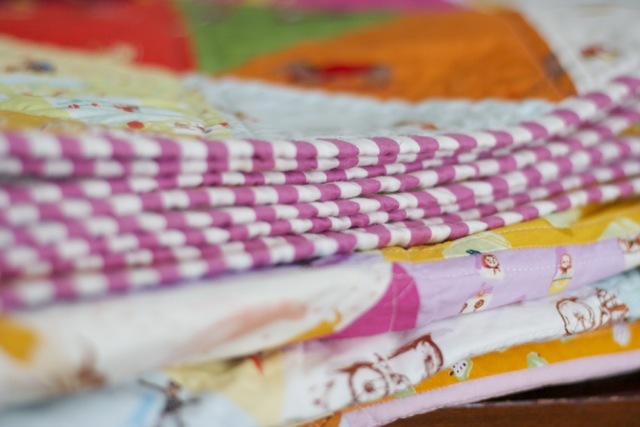 I get so discouraged sometimes looking at everybody's complicated quilts with elaborate quilting (that I can't do). love it so much nettie! oh wow! If she doesn't love it, I will take it! That would be the perfect quilt to cuddle up on the couch under while reading a good book. OMG this is amazing. You are a brave brave lady cutting into your munki munki. I don't have much, but I don't think I could do it. I love it. :) It's so, so pretty. 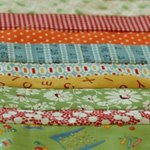 Hi there :) it's my first time at your blog, and I just had to tell you how much I love all your quilts! I've just begun my very first quilt (I'm hand piecing and quilting). It's great to see al, of your finished projects - inspiration to keep going. :). Everytime I see these triangles I wonder why I still haven't bought a triangle ruler! This is really really beautiful. I know I'm a little late to the party, but I love this! Fantastic job! Oh Nettie! WHAT COURAGE YOU HAVE!!! I'm so impressed. I need to do that. I'm just so afraid to cut into that Heather Ross stash. Your daughter may not appreciate it, but I bet you will never get rid of that quilt, at least not for a long time. It's beautiful! Love the pink binding. How big are your triangles? I just love stripped bindings too! They add so much pizazz! i, too, have been hoarding heather ross fabrics. its time for me to follow suit! love the triangles! any tips would be so much appreciated! 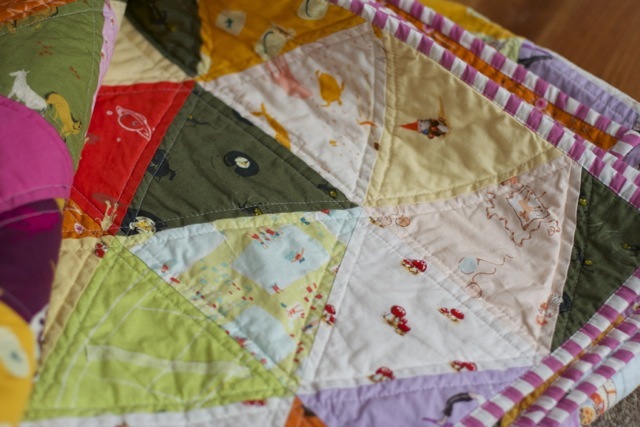 Very Nice, I am working on a triangle quilt like this and now I am motivated to finish it. It may be good that you didn't pick princesses as your daughter will grow out of wanting that. When my daughter was about 9 yo she stopped wanting anything princess, now she is into modern.